For regular updates and more information about Bike To School Challenge, visit www.centurycycles.com/to/BTS or follow it at www.facebook.com/BikeToSchoolChallenge. · In 2011, Bike To School Challenge dramatically increased the use of bicycles as a means of transportation to school. During the three-week program last year, 53% of Bay Middle School biked each day (430 students per day on average) and 31% of Rocky River Middle School (193 students per day on average). 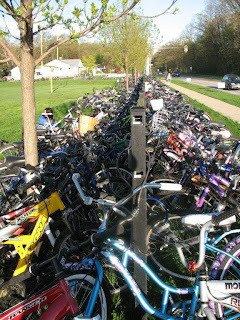 Each school’s number of cyclists remains above national averages after the program’s conclusion, according to random bike rack counts. 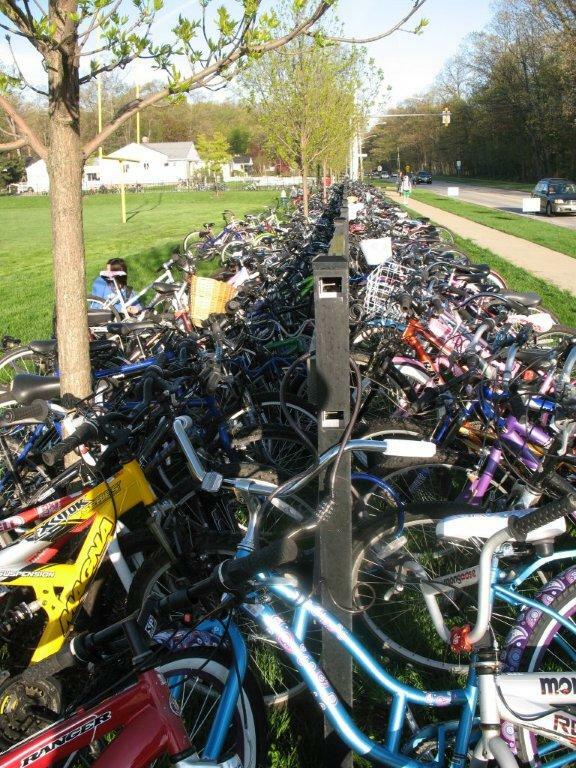 · Since Bike To School Challenge began in 2008 in Bay Village, Bay students have pedaled a total of 102,803 miles during the three weeks each May. This is in stark contrast to national bicycling trends. · In 2009, only 13% of students in grades K through eight bike or walk to school (in 1969, that number was 48 percent), reports Safe Routes to School National Partnership. According to Bike To School Challenge surveys and bike counts, currently fewer than 5% of Root and Claggett Middle School students are biking to school, a statistic the program strives to improve. · From 1976 to 2008, the percentage of overweight children 6 to 11 years old more than tripled. There are many potential benefits of physical activity for youth, including weight control, reduction in the risk of diabetes, stress reduction, relief of ADHD symptoms, and even better academic performance. In an article published January 2012 in the Archives of Pediatrics & Adolescent Medicine, researchers found that participation in physical activity is positively related to academic performance in children. · Bicycling to school gives children time for physical activity and an opportunity to be outdoors, a sense of responsibility and independence, and the entire community benefits when there is less traffic congestion and better air quality. Students at Bike to School Challenge schools carry a “Ride Card” that is stamped each day they ride a bike to school. When they accumulate four bicycle rides to school, students receive a free t-shirt from main Bike To School Challenge sponsor and organizer Century Cycles bicycle store. The more they bike, the more they can win – every Ride Card they fill up earns them more entries into a grand prize raffle. Safety is also rewarded: They earn twice as many entries if they wear a bicycle helmet. There are also daily incentives to bike to school. Subway stores in Rocky River, Medina and Bay Village are offering a BOGO Footlong to each student who bikes tomorrow for Day 1. Honey Hut Ice Cream is throwing after-school ice cream parties for those students who bicycle on May 11 (Rocky River Middle School), May 17 (Bay High School) and May 18 (Bay Middle School); and Smuckers has provided an after-school snack for bicyclists to Medina middle schools on May 22. There is a special grand prize drawing for a Cedar Point gift card for the students at each school who biked every day of Bike to School Challenge. The schools can also win a grand prize from Bike To School Challenge. Raleigh Bicycles has offered a $500 award for bicycling or physical education improvements at each school if it exceeds their bicycling benchmarks from 2011 (or pre-Bike To School levels). Inspired by a student car boycott to protest high gas prices in 2007, Century Cycles owner Scott Cowan approached his alma mater Bay High School about what he could to encourage more bicycling to school. Bike To School Challenge was born and was enthusiastically embraced by the students and faculty. Participation in 2008 exceeded organizers’ expectations. In 2009, the program was expanded to include Bay Middle School. It expanded to Rocky River Middle School in 2011 and to the Medina middle schools this year. In 2010, Bike To School Challenge won the city’s Project of the Year Award from the Bay Village Community Council.